WASHINGTON, DC, October 2, 2017—Corporate magazines will make a roaring comeback in 2017, according to a prediction by Goodly. The blog bases its prediction on an unflagging belief marketing obeys the law of eternal recurrence. 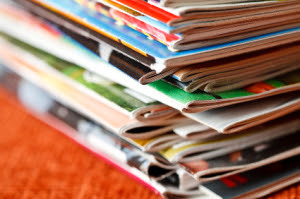 “Corporate America is on the verge of once more of embracing the print magazine," says Bob James, owner and chief storyteller. Although entire in-house departments and outside design studios were dedicated to their production during much of the 20th century, corporate magazines fell from grace in the late 1980s. "The time is right for their inevitable comeback," James says. "The universe can only stand so much digitalization before it lashes out in ink and paper." In October's edition of Chief Content Officer, Joe Pulizzi, founder of Content Marketing Institute, likens the brand-building power of print magazines to live events. "We are in the experiences business," Pulizzi says. "We create those experiences through valuable, consistent content. While most of your competitors are focusing on digital experiences only, savvy brands see the opportunities offline." Pulizzi notes that winning brands Red Bull, LEGO, Dell and Marriott all have splashy corporate magazines. With 1,500 pageviews a week and climbing, Goodly is devoted to helping professionals express ideas precisely. Guest posts are welcome.